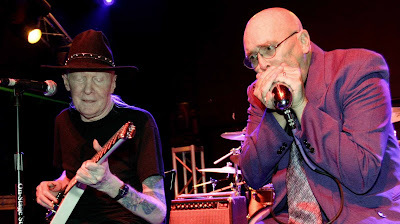 Above: Johnny cuts loose with Pat Ramsey on "Hoochie Coochie Man" at the Freebird Cafe in Jacksonville Beach, Florida, on December 14. The latest: Johnny will enjoy some time off at the beginning of 2008 after playing a trio of post-Christmas gigs this week in Ann Arbor, Michigan; Mt. Pleasant, Michigan; and West Dundee, Illinois. He'll spend most of January in the northeast before heading out to the West Coast and Pacific Northwest in the latter half of February. For a complete list of Johnny's current tour dates, click here. And to check out a couple of recent newspaper features, click here and here. Johnny earns BMA nomination! "Breakin' It Up, Breakin' It Down," which features Johnny, Muddy Waters and James Cotton, has earned a Blues Music Award nomination for Historical Album of the Year. Winners will be announced May 8, 2008, when The Blues Foundation presents the awards at the Grand Casino Event Center at Tunica Resorts, Mississippi, just a stone's throw away from the event's longtime Memphis home. For more information and a complete list of this year's nominees, click here. Around the Web: We're always on the lookout for all things Johnny on the World Wide Web. Some cool photos here.